Reading a water meter is similar to reading an automobile odometer. There are two styles of TouchRead meters. Style A has an eight-digit number on the face. Style B has a six-digit number on the face called the readout (see illustration below). This shows the total number of units used, as well as partial units. To calculate your water use, pick a starting point at which to read your meter. Record the reading and date. Read the meter 24 hours later. Subtract the first reading from the second, this will give you your usage in hundred cubic feet or units. Each unit is equal to 748 gallons. Multiply by sixty (60 days per billing period) to approximate your water usage for one billing period. Note: The Westborough Water District charges for water by the unit (100 cubic feet or HCF). Each unit (HCF) consists of 748 gallons. 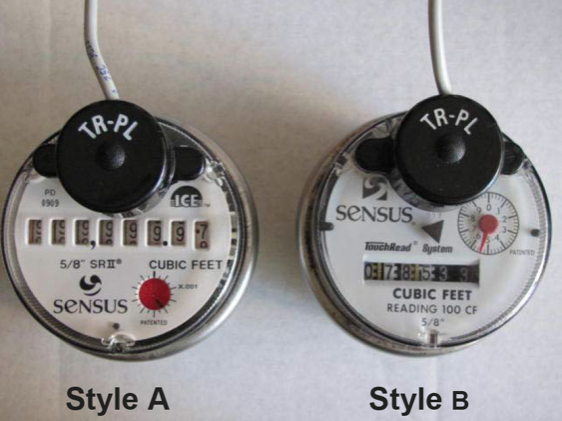 Read your meter on a regular basis to track your water use and keep a record of all readings. You will be able to detect trends from season to season and year to year. If your household changes in any way that affects water use (e.g., new family member, plumbing upgrade, etc. ), you will be able to determine the change. The little triangle or red wheel on the face of the meter is a low flow indicator. It will rotate with even a very low flow through the meter (i.e., leaky toilet or irrigation valve). To check for leaks, turn off all known water uses inside and outside the house. If you have an automatic icemaker, make sure it is not operating. When all water is turned off, the low flow indicator should not move. If the low flow indicator is moving, there is water flowing somewhere on your property. Try turning off the house shut-off valve (usually located where the water line enters the house). If the low flow indicator continues moving with the house valve off, water is flowing outside the house (most likely the irrigation system). If the low flow indicator stops moving with the house valve off, water was flowing inside the house. (This could be a toilet leak, a leaky pipe, or any number of problems.) When you have finished reading the meter, carefully replace the meter box lid.